In a medium sized bowl whisk together mayonnaise, yogurt, Dijon and ranch seasoning until well combined. Add the chicken, tomatoes, bacon and green onion to mixture and stir until evenly coated. Refrigerate for 1-2 hours for flavors to combine. Take tomatoes and cut the top off. Core the middle to remove the seeds. 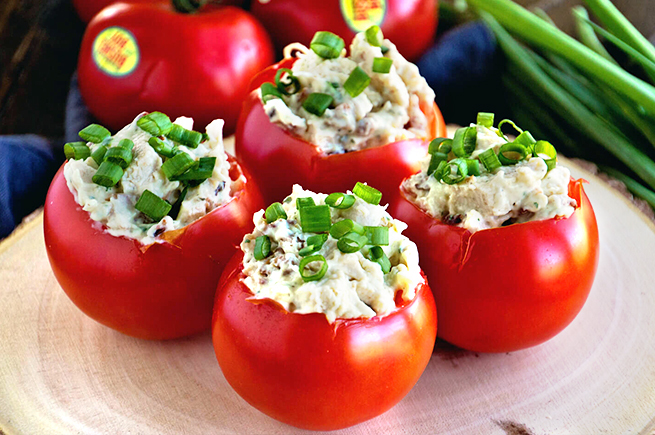 Stuff tomatoes with chicken salad mixture.